Born on : 28 septembre 1951 à Vevey, canton de Vaud. Origine : Châtel St-Denis, Switzerland. He starts Judu on 8 February 1967 at the Judo-Club de Montreux with Felix Zbinden (following Pascal Krieger who started in 1963). One evening of 1971, Pascal, returning form Japan, visited his former club, with a 2nd dan in judo, a 1st dan in jodo and a 3rd dan in iaido. That evening, Michel Colliard saw Pascal for the first time and could participate in a common judo training with him, then Pascal presented, alone, a completely unknown discipline in Europe called jodo, followed by a demonstration of iaido. About 4 years later, Pascal came again, this time accompanied with Matthias Wenderoth for another presentation of jodo. 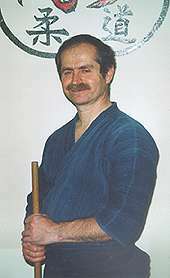 Michel Colliard was very impressed by the remarkable demonstration of jodo. He decided to begin the study of this weapon with a dozen fellows judomen in 1977 and talked the Montreux Judo Club into creating a new section for classical weapons. In January 1979, he also starts the study of iaido under the direction of Pascal Krieger who comes to Montreux from Geneva twice a month to teach Judo, jodo and iaido. Without forgetting my close relationship with my friend and teacher Pascal Krieger Sensei.